- Eyewear retainer total length -- 70cm/27.6in/2.3ft. - Colors of eyeglass holders strap -- Pink,Grey, Light brown, Brown, Black. - Quality glasses strap holder is made of premium leather and silicone rubber, which is durable and hard to break when glasses retainer strap is used. - Classic & Stylish eyeglass string holder is suitable for EVERYONE - men,women,boys,girls,or kids & children. ◆ Adjustable eyeglass retainers -- Use the adjustment bead to lengthen or shorten the flat eyewear retainer. 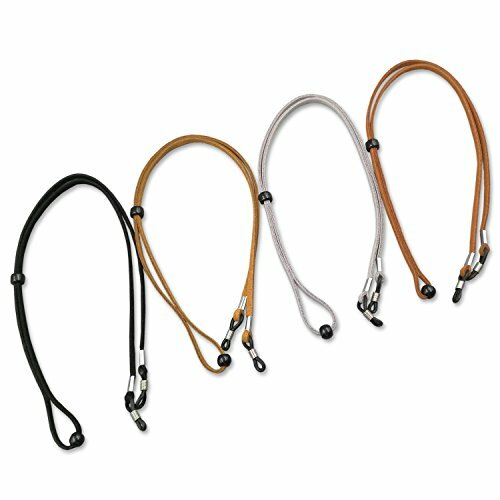 ◆ Universal eyeglasses lanyard -- can be used for eyewear,sunglasses,reading glasses,safety glasses,etc. And its rubber connectors fit all glasses frames & arms from narrow to wide. ◆ Simple & Comfortable Design of the eyeglass sports lanyards is perfect for running, basketball, travel, climbing, learning, work. ◆ Eyeglass chain leather lets you hang them around your neck, so you have access to your glasses Whenever & Wherever you need them. Eyeglass lanyard protects your glasses, and you no longer have to worry about losing glasses. Glasses lanyard total length: 70cm/27.6in/2.3ft. QUALITY sunglass straps is made of premium leather and silicone rubber, which is durable and hard to break when glasses retainer strap is used. CLASSIC & STYLISH eyeglasses holder strap is suitable for EVERYONE - men,women,boys,girls,or kids & children. UNIVERSAL glasses sports strap -- can be used for all types of eyewear,sunglasses,reading glasses,safety glasses,etc. And its rubber connectors fit all glasses frames & arms from narrow to wide. If you have any questions about this product by Kalevel, contact us by completing and submitting the form below. If you are looking for a specif part number, please include it with your message.